“I am emerging from a long silence on the subject of vaccination, because I feel that, this time, the stakes involved are huge. The consequences may spread much further than anticipated,” writes Lanctôt, who believes the A(H1N1) virus will be used in a pandemic concocted and orchestrated by the WHO, an international organization that serves military, political and industrial interests. Lanctôt warns that the elite and their minions will introduce a compulsory vaccination that will contain a deadly virus and this will be used specifically as a eugenics weapon for “massive and targeted reduction of the world population.” Moreover, a pandemic will also be used to further establish martial law and a police state, according to Lanctôt, and activate concentration camps “built to accommodate the rebellious” and eventually transfer power from all nations to a single United Nations government and thus fulfill the sinister plans of the New World Order. During her trial in 1995, Lanctôt used an episode from the March 11th, 1979, 60 Minutes TV show covering the massive vaccination program foisted on the American public supposedly in response to the 1976 swine flu outbreak. It was later established by the CDC that the virus originated out of Fort Dix in New Jersey. “The Fort Dix outbreak may have been a zoonotic anomaly caused by introduction of an animal virus into a stressed population in close contact in crowded facilities during a cold winter,” note Joel C. Gaydos, Franklin H. Top, Jr, Richard A. Hodder, and Philip K. Russell. It was also characterized “a rare example of an influenza virus with documented human to human transmission,” according to Johns Hopkins Bloomberg School of Public Health in Baltimore. The virus is “thought to be a direct descendant of the virus that caused the pandemic of 1918,” explained Richard Krause, director of the National Institute of Allergy and Infectious Diseases at the time. Instead, numerous people came down with Guillian-Barre syndrome, a paralyzing neurologic illness, after receiving the government-hyped vaccination. In April, Army criminal investigators were looking into the possibility that disease samples went missing from biolabs at Fort Detrick. “Chad Jones, spokesman for Fort Meade, said CID is investigating the possibility of missing virus samples from the U.S. Army Medical Research Institute of Infectious Diseases,” the Frederick News Post reported. “Obviously, in light of the current swine flu scare, and the new strain’s possible synthetic origin, the fact that virus samples may have gone missing from the same Army research lab from which the 2001 anthrax strain was released is extremely disturbing,” Paul Joseph Watson wrote at the time. Using the “swine flu” as a pretext, the defendants [in Bürgermeister’s lawsuit] have preplanned the mass murder of the U.S. population by means of forced vaccination. They have installed an extensive network of FEMA concentration camps and identified mass grave sites, and they have been involved in devising and implementing a scheme to hand power over the U.S. to an international crime syndicate that uses the UN and WHO as a front for illegal racketeering influenced organized crime activities, in violation of the laws that govern treason. Obama’s Bilderberg Health and Human Services Secretary Kathleen Sebelius — and Bilderberg member — wants to make it easy for kids to get their toxin-laden eugenicist “swine flu” vaccine this fall. 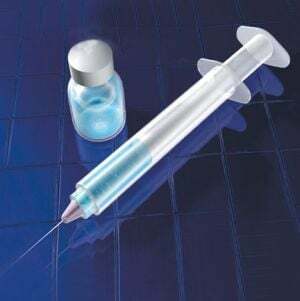 “Schoolchildren may be first in line for swine flu vaccine this fall — and might even be able to get the shot right at school,” the Associated Press reported on June 16. As we noted last month, the government appears to be planning a mandatory flu vaccination program. In a recent article on the unfolding economic collapse, Rep. Ron Paul warns that the hysterically hyped H1N1 flu “pandemic” may result in the government requiring mandatory flu vaccinations. “Nearly $8 billion will be spent to address a ‘potential pandemic flu’ which could result in mandatory vaccinations for no discernible reason other than to enrich the pharmaceutical companies that make the vaccine,” writes Paul. Considering the track record of the global elite, the government-mandated vaccination program now in the works — as Ghislaine Lanctôt and Jane Bürgermeister warn — will serve the eugenicist plan to depopulate the planet. A contrived pandemic will also set the final stage for the implementation of martial law and a high-tech surveillance and police state grid.